I will confess (as I have many times before) that I am a neutral lover. I honestly just prefer less color in my wardrobe. 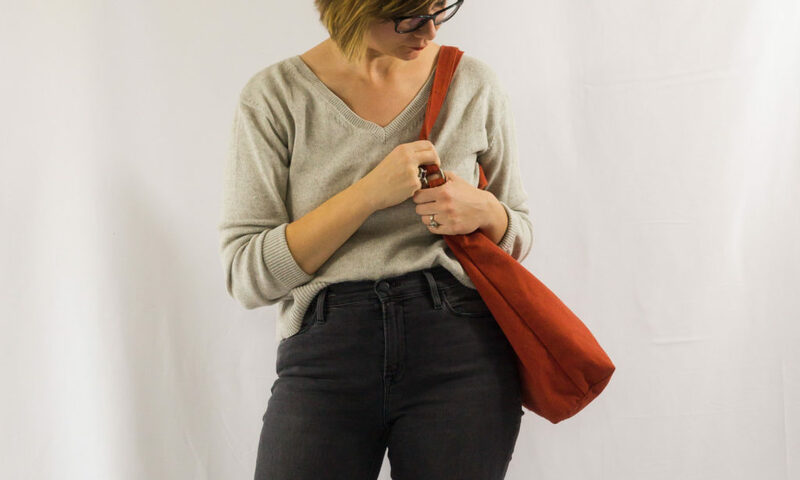 But lately I have been craving a bit more color and this bag is the perfect way to do it. Because I don’t have to go out and buy a whole new wardrobe just to satisfy my color itch. My craving for color may eventually fade away and I won’t have stuffed my closet full of something I may not be interested in later on down the road. Now, if I’m still craving color in three years, then yes, maybe then I can add a colored top or pair of pants to my wardrobe. But I need to prove to myself that I’m actually truly into it first. How do you guys handle your desire to change up your capsules with a new direction? Do you pause and take your time? Or do you find yourself rushing it? Great post! I’ve been just thinking about this very topic. I have a tendency to collect, so when I find a new favorite item or color, I find myself wanting to go out and get a couple more similar items. This is a good reminder to me to still try a new idea out, but perhaps with just with one item. Currently I’m into camel. I never used to pair brown tones with blacks and charcoals but I’m enjoying mixing it up these days. On a different note, can you let me know how to find your capsule planning guide? I think I subscribed, but I’m not sure how to get to it. I’m the same way Jackie! I’m trying to slow down and not just run out and stock up on every trend that catches my eye. The capsule guide should have automatically been sent to you… not sure why it didn’t work! Stay tuned because I plan to have a link to it at the top of my blog soon. I double checked and I didn’t get it! No rush though, I can wait for the link. 🙂 My idea is to get a early post partum capsule ready to go before the baby comes…that way all my clothes will be organized and in one place for easy grabbing! But I’m not due for another 7 weeks so I have some time! Okay! I’ll add it at the top of my main page hopefully today or tomorrow!